Alpine Bin Rentals provides fast and friendly dumpster rentals to the Cambridge community. Located in the Waterloo region of southern Ontario, Cambridge is a city of approximately 130,000 residents. It is in 1973 that the city was formed from an amalgamation of the City of Galt, the towns of Preston and Hespeler, and the hamlet of Blair. 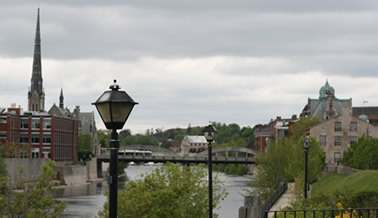 Today, Cambridge is known for being home to many cultural events and activities, as well as the oldest operating arena in Ontario (Galt Arena Gardens). You guys did a great job and I will definitely use you again for any future projects. You're the fourth disposal company that I've used and the first to get it right. Southern Ontario's #1 disposal bin rental service and junk removal contractor. Ask about our bins, rubbish removal, junk removal and demolition services. Website developed by Human Code.